The Hayrack Cafe - Breakfast, lunch and dinner, whatever the weather! The Hayrack Cafe is a welcoming place, open daily serving warming breakfasts, delicious light lunches and freshly prepared 'home-style' cooked meals. The childrens menu is always popular, whether they choose a hot meal or lunchbox deal. 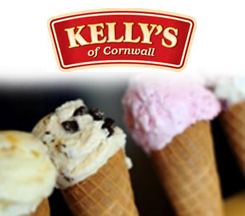 We also serve an impressive selection of tempting home bakes, cakes and biscuits plus a large selection of the famous 'Kellys Ice Cream'. The cafe is open and spacious and in the warmer weather you can take advantage of the outside decking area overlooking the waterfall and duck pool. 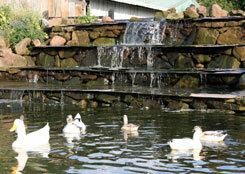 There you can relax and enjoy the tranquility while the children enjoy their playtime. Our food is made on the premises daily using the same produce we sell in our farm shop and butchers ensuring quality and freshness. Our menu caters for everyone with the emphasis on quality and taste and we have an excellent reputation for good food and value for money. The menu is changed regularly to take advantage of local seasonal produce and there are always a selection of 'Specials' which you can view when you arrive. 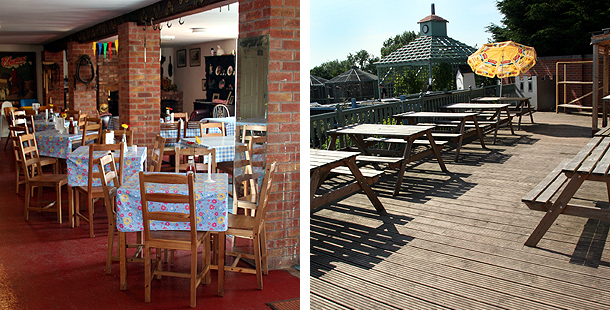 The Hayrack Cafe is available for celebrations, whatever the occasion and we are able to cater for educational visits and childrens parties when booked in advance.